Origin of World Contact Day | Edinburg Out of This World! 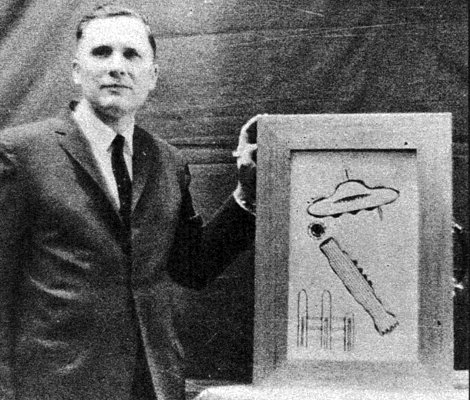 In the late 1940s and early 1950s, Alfred K. Bender of Bridgeport, Connecticut, became fascinated by the ever-growing number of “UFO” sightings throughout the United States and the world. 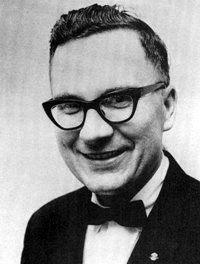 Bender, who worked as a supervisor at Acme Shear in Bridgeport (now called the Acme United Corporation), a company that made scissors, shears, and other devices for cutting, began collecting newspaper and magazine clippings about UFO sightings. Obsessed with solving the mystery of the UFOs, Bender became convinced that members of his group should “attempt to send out a telepathic message to visitors from space.” March 15, 1953 was chosen as “Contact Day.” Bender sent out a special bulletin, containing a message to be memorized and an appeal to have all members focusing their minds on the message at the exact same moment, at 6 p.m. on March 15. When he snapped out of his “contact,” Bender found a yellow mist hovering in his room, and he saw out of a corner of his vision what seemed to be the shadow of a humanoid. He also noticed that the radio in his bedroom had turned on by itself and that there was a strange odor in his room. Bender later claimed that in this, and other “contacts,” the whole mystery of the flying saucers was revealed to him. An incredible story of the origin of World Contact Day! For more information about World Contact Day, visit http://worldcontactday.com.